As readers of this blog know, I've been into making my own version of household cleaning and beauty products for a long time now. Making my own shower gels, shampoos and soaps helps me to save money and use less environmental resources. More important to me personally, making my own products means I know exactly what ingredients go into them, which helps me to avoid toxic ingredients that are unfortunately common in many store-bought brands. As a pregnant woman, this helps me to feel a lot better about things. When it comes to the foods I eat, the lotions I put on my body, and everything in between, I prefer to avoid long lists of unpronounceable ingredients. When it comes to DIY beauty products, I refuse to make anything that requires more than five ingredients. I also refuse to make anything that calls for a hard-to-find ingredient that requires a trip to a specialty store. DIY to me is all about simplification. A small proxy of friends and I are part of a Ladies Night group, where we meet once a month for whatever activity that month's host chooses. In the past this has included dinners, Happy Hours, picnics, clothing swaps, croquet and more. A few months ago, some of my friends expressed interested in learning more about the homemade beauty products I make. I was thrilled to host a party showing them how to make their own. Preparing for this party could not have been simpler. I already had many ingredients on hand but also went to the store to stock up on more. I wanted to show my friends how to make a simple shampoo, shower gel, hand soap and face wash (and at the last minute I remembered a two-ingredient recipe for an eye cream, too). The only ingredients I needed to make all these different products were coconut oil, honey, castile soap, almond oil, olive oil, vitamin E oil, and coconut milk. I also had a small bottle of tea tree oil on hand as an optional ingredient. My friends brought their own essential oils, which were also optional. My friends also brought money to cover the expense of buying ingredients, so nobody went broke in the making of this party. Often when we get together, my friends and I throw together potluck-style meals. Last night was no exception. I wanted to make a casserole-style dish that could feed a large group and didn't contain any dairy since one of my friends is lactose-intolerant. 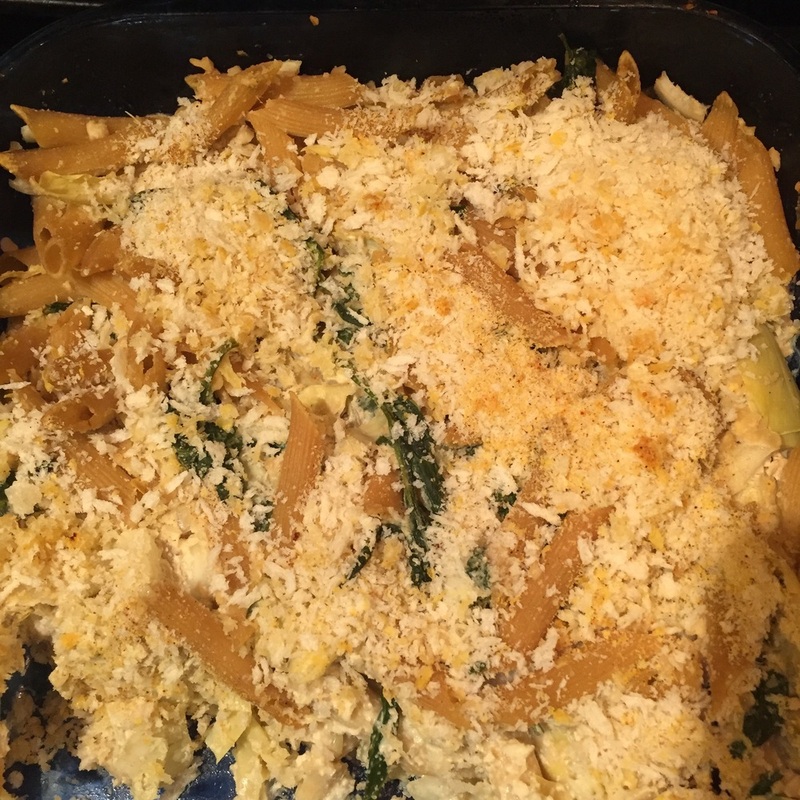 I found this Vegan Spinach & Artichoke Pasta Bake recipe online and I LOVE it. It has all the delicious creaminess of dairy without containing any actual dairy. (Cashews are a miracle ingredient.) My friends, meanwhile, brought delicious bread, crackers, dips, fruit, veggies, wine and macarons. We ate everything out on the patio and talked for hours after making our DIY goodies. It ended up being a fun and sweet night. All of the recipes I used for the products we made can be found here: A Day in the DIY Life.